As you see in the image attached, you see the cylinder through the glass, but not the orange. But the orange does cast a shadow trough the bowl. the orange is created in zbrush, mapped and textured then imported to maya. How do i make the orange visible through the bowl and how can i make the oranges shadow not opaque. 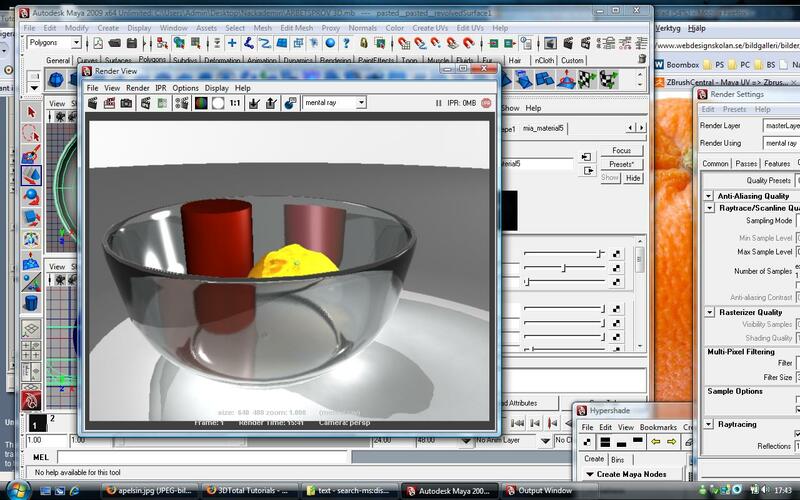 The index of refraction on your glass shader is too high so that it bends the light and the objects inside the bowl are not visible. Try to play with it until you get the desired results. Regarding the opaque reflection just make the amount of reflection smaller or add a falloff or gradient to the reflection amount attribute so that it reflects less when the surface is perpendicular to the camera direction and more when it is parallel to the camera direction. You can also add a Fresnel effect to the reflection if it is available in Maya. Post subject: the answer made me feel stupid. I just went nuts trying to figure this same problem out. I created a water bottle, with a straw in it, but the straw and anything else that went inside the bottle disappeared. Same with particles. And then after searching I found a suggestion that made me feel very stupid. The object in the attribute ediotor didn't have the visible in refractions, or visible in refelctions checked off. And I feel silly. Good point I didn't think about it.